The enhancement of the new Versafire digital printing generation is fully focused on customer benefit and the market requirements. With the Versafire EV, Heidelberger Druckmaschinen AG (Heidelberg) now offers a truly versatile digital production system, designed for use at entry level as well as by experienced digital printing providers. “The Versafire EV gives our customers a flexible production system that is specially designed to ideally meet the requirements in the graphic arts industry and that they can use to further enhance their digital business model as a result of diversification and optimization,” explains Stephan Plenz, Member of the Management Board responsible for Digital Technology at Heidelberg. With the new “invisible red” special toner, the Versafire EV offers now a total of five special colors. Along white, clear toner, neon yellow and neon pink, “invisible red” provides additional embellishment options. In daylight, it has a slightly glossy effect and under UV light, the toner shines bright red. The use of “invisible red” provides protection against copying and is particularly suitable for security-relevant applications. The five special colors facilitate a wide variety of creative applications, such as printing luminescent posters, invitations, admission tickets, wristbands, bright advertising brochures and security elements on printed products. The new Versafire EV is able to print white first and the CMYK process colors on top, creating strong luminous images when printing on colored substrates and achieving new unusual effects. Where previously several processes were required, it is all done now in a single pass. The new automatic inline calibration and inline register provide a high degree of stability, precision and improved quality. Inline color measurement and automatic calibration take place ahead of the printing process and ensure constant color stability across the entire run. Top image quality is achieved thanks to the new resolution of 4,800 × 2,400 dpi. The Versafire EV has an increased printing speed of 85 or 95 A4 pages per minute and processes grammages of up to 360 gsm, ensuring a high level of productivity. Furthermore, the system is able to print banners up to a length of 700 mm (duplex) and as much as 1,260 mm (simplex). The Prinect Digital Frontend (DFE), developed by Heidelberg and unique in the print media industry, allows intelligent integration into digital and offset printing processes. Using this DFE the Versafire EV can be easily integrated into the existing workflow of a print shop at the same time that it processes variable print data considerably faster. Another new feature is the 17-inch touchscreen to control the machine and the print jobs directly from the DFE ensuring that the operator can keep an eye on everything. Since the middle of last year, more and more customers have attended Versafire production training sessions, gaining valuable detailed knowledge about setting up media and the machine itself. In addition, customers receive a matching software to control media set up, the Media Management Tool. The assistant-aided user interface enables the time and work needed for setting up substrates to be significantly reduced. All settings can be saved, exported and imported, as well as loaded onto other Versafire machines. JD Druck GmbH in Lauterbach in Hesse is the ideal company for field testing the new Versafire EV. The print shop has focused on exceptional customer service and top-class quality for more than 125 years. Today, 65 employees produce offset and digital printing products for renowned agency and industry customers, as well as for publishers. They focus on advertising printing but small packaging jobs and point of sale displays are also produced. The catchment area stretches from Germany to Austria, Switzerland and Luxembourg. “We entered the digital printing sector very early and I believe in the opportunities that personalization and customization bring,” confirms Managing Director Jörg Göttlicher. The trained typesetter took over the print shop from his father in 1991 and is systematically developing the company. This is evident when one looks at the machines in the digital printing department – where the various Heidelberg Versafire models can be found. At the end of January, JD Druck began the field test with the new Versafire EV and is able to directly compare the performance with the predecessor models. “The Versafire EV is heading in the just the right direction and, after just a short period of time, we can see very positive results,” confirmed Jörg Göttlicher. When asked about the best new features, operator Steffen Möller came up with a number of points. “One of them is the improved user-friendliness due to the new feeder with a flap, which means inserting the banner paper is now much easier. Also, the larger 17-inch touchscreen makes configuring the basic settings much more simple.” In addition he is also happy with the automatic inline register and good color stability ensured by the new inline sensors. “The possibility of now printing white first is super. It saves us a printing operation and creates great effects and quality on colored paper,” says Möller enthusiastically. With multiple certifications of the Deutsche Post, JD Druck already has a very good reputation in the digital printing sector with its direct mailing and letter shop services. “We put our trust in state-of-the-art printing technology and in highly-motivated staff,” explains Jörg Göttlicher. “This includes all-round service with B-to-B shops, fast delivery and logistics services. 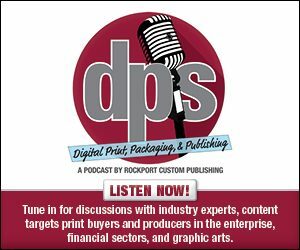 We produce small runs and rush jobs as well as personalized products by means of digital printing and larger runs and gang runs with offset printing.” The press room boasts a Speedmaster XL 105 five-color press with coating, and postpress has four Stahlfolder folding machines, a Stichmaster saddlestitcher and two Polar cutting machines. In the summer, an Easymatrix die-cutter will be installed so that the company can also benefit from this added value and achieve faster processes. Customers and interested parties can experience at first hand the new design possibilities and the enhanced media applications of the Versafire EV at its European launch at the Heidelberg site in Wiesloch-Walldorf on April 18, 2018.